I built a kayak from a Folbot kit when I was a teenager and had lots of fun using it. Then ten years ago, I bought a foldable version from the same company, the two-seater Greenland II. I don't use it much, but it sure expands the options on trips. So early this spring, a friend was asking about a backpacking trip to Thousand Island Lake, so I called the Reds Meadow Pack Station. They assured me they could pack my boat in a bag to Thousand Island Lake, so I signed on. 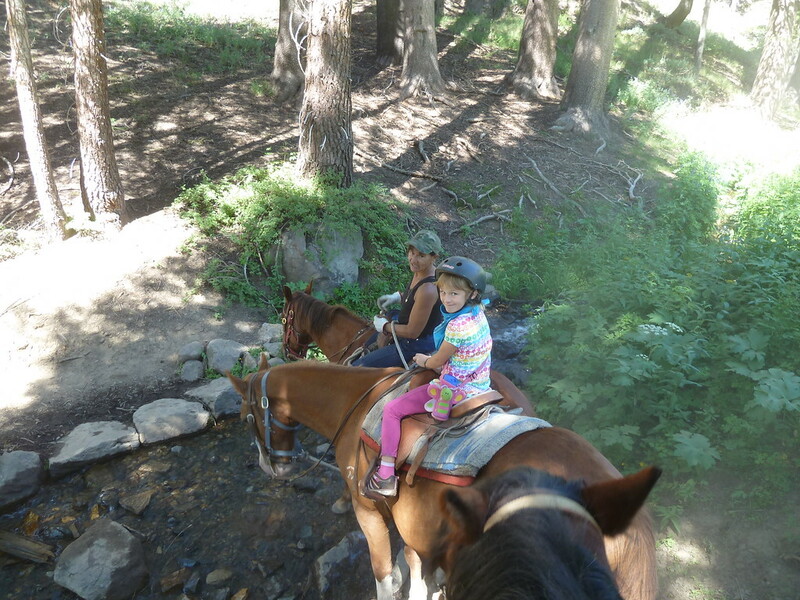 I wanted to take my wife and daughter in, too, but they couldn't hike the ten miles, so we reserved three horses as well. So August rolled in, and off we went. 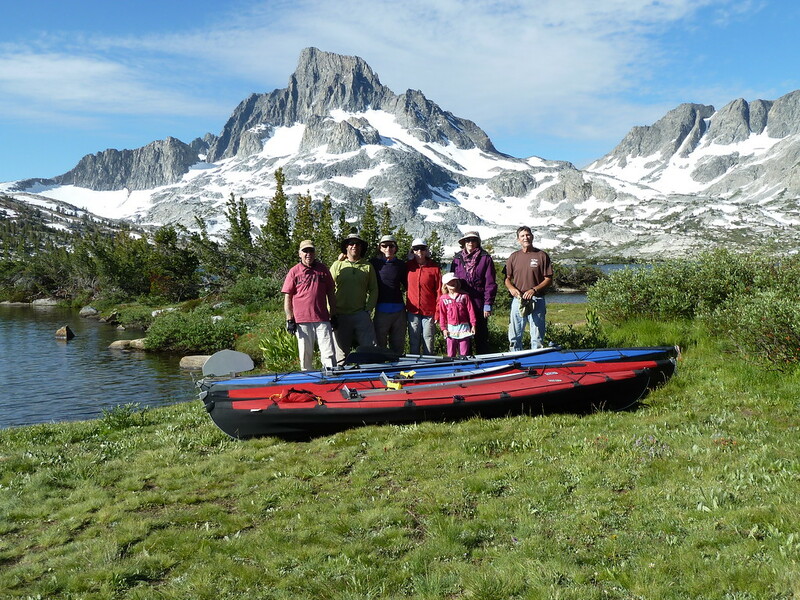 We spent two nights in Mammoth to acclimate, then showed up at the Agnew Meadows pack station with what seemed like a huge amount of gear. The packers had four mules ready to go, but one got the day off. 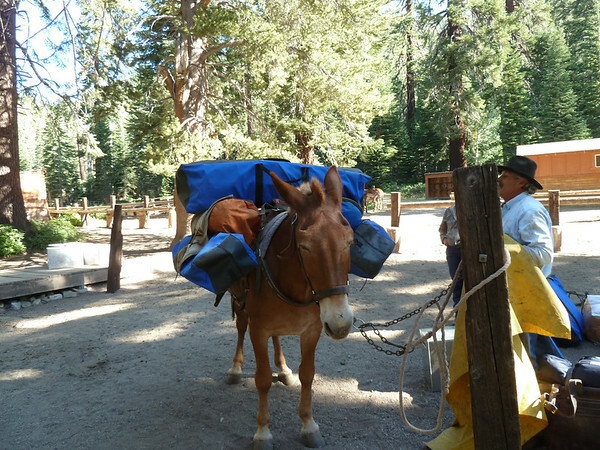 All the gear -- three kayaks, two bear-proof pack boxes, and camping gear for seven fit onto three mules! Here's 20-year-old Rick, with the longer boat bags. 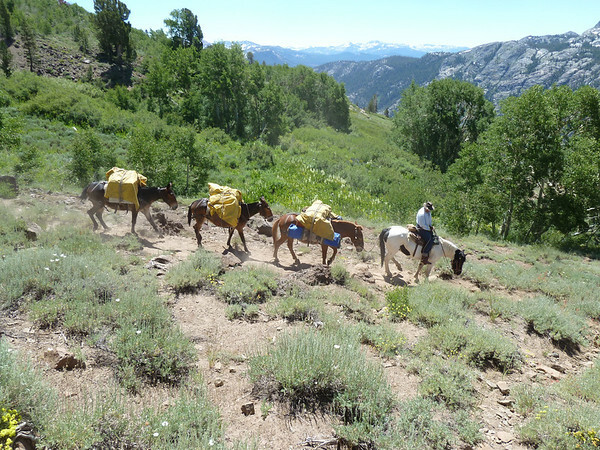 It took several hours to get the mules loaded and the horses lined up. We got a late start, but the trail was beautiful -- more flowers than I'd seen on any other trail. 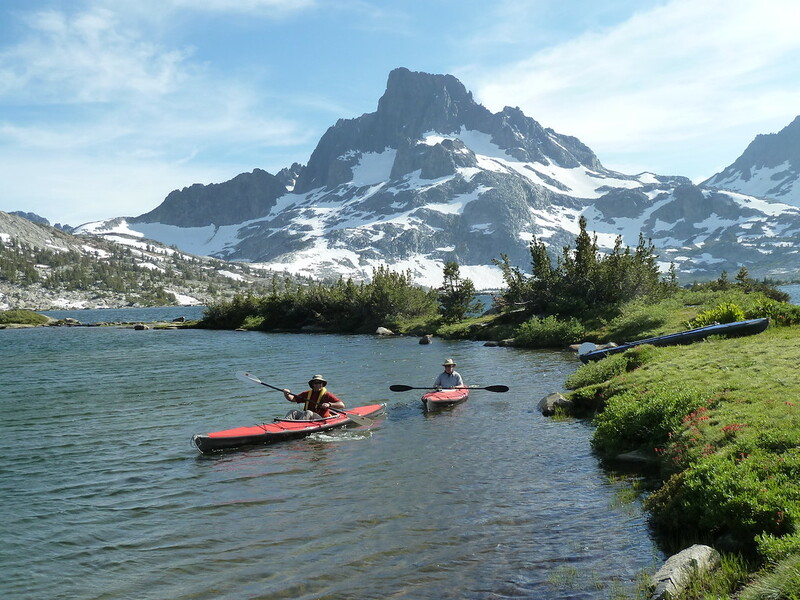 We took the "High Trail" into Thousand Island Lake. Water break -- Charlee did well riding all the way. It took four hours. 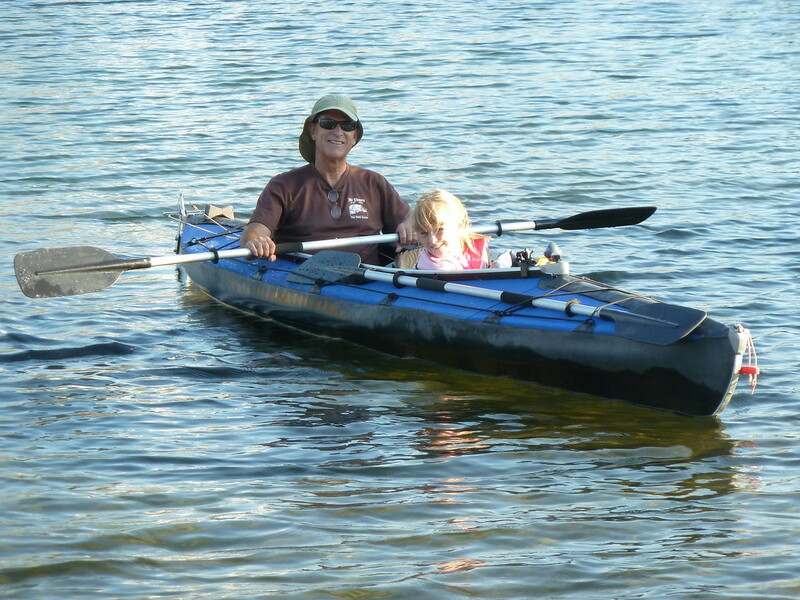 Charlee and I enjoyed a quiet paddle each evening, exploring islands and the view. On the second day, the three of us paddled out, along with Jenny in a single-seat kayak, going to the west end of the lake. Here's Marek and David. David joined the trip when I posted plans on the Folbot forum. That's Banner Peak in the background. Three of us climbed it on the third day. 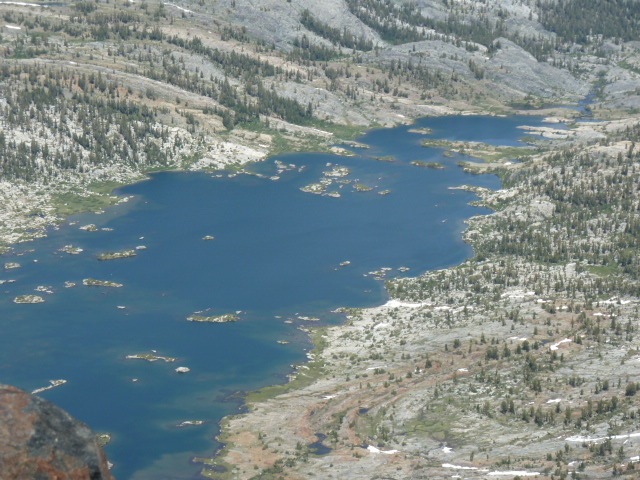 Here's a view of Thousand Island Lake from the summit of Banner Peak. On the morning of the fourth day, I went out for a paddle to take pictures. This trip was truly a memorable experience, well worth the planning and expense. 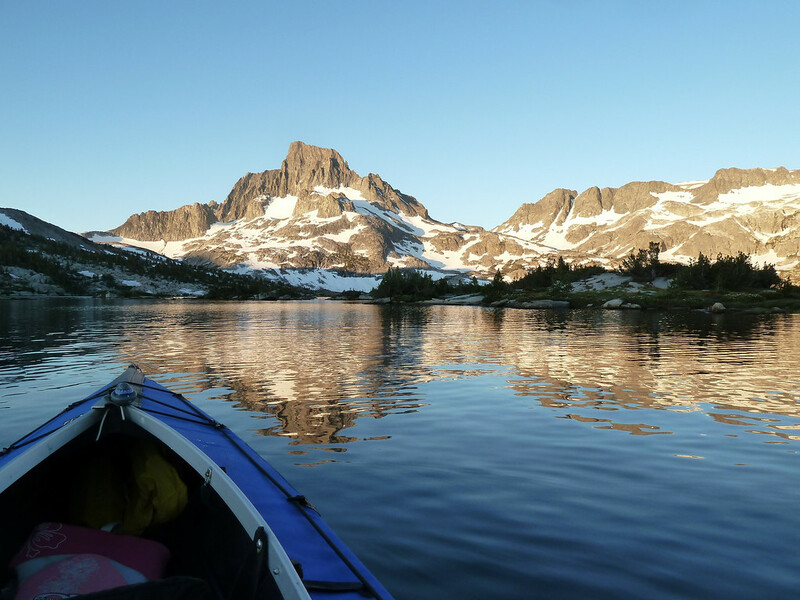 The good times, the fun with friends, paddling on one of the prettiest places in the Sierra... What a trip! Great picture from Banner; it really gives a feeling for the size of the lake. 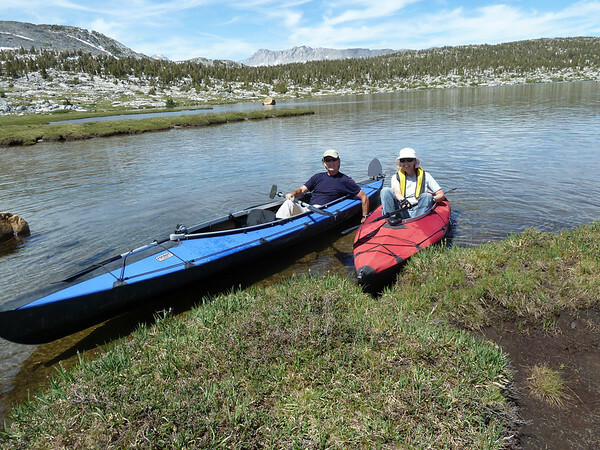 I will have to look into these kayaks, as I am use to the cumbersome normal types. Nice pictures; nice family trip -- good for you going the extra mile to include your family! 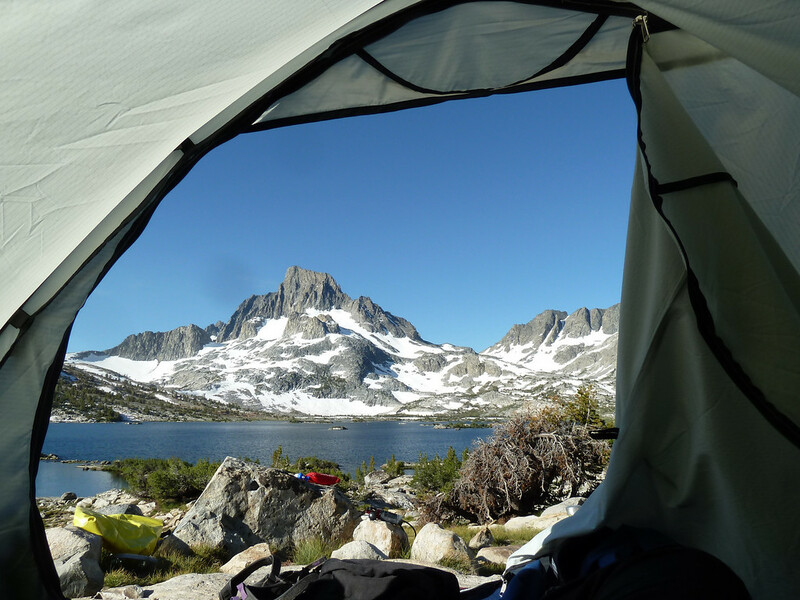 Simply spectacular views. Memories for a lifetime with your family. As a followup, someone asked how long the hikers took. Marek reported about 4 1/2 in, with the elevation gain and many breaks. It took 3 1/2 hours on the return trip. They all just carried day packs. What a great family trip, especially with the kayaks. Thank you so much for sharing your family vacation at Thousand Island Lake. It's so beautiful there. Tammy, Sandy and Virginia will love this place, I sent them a link to this thread. Thank you for telling us about this beautiful place. 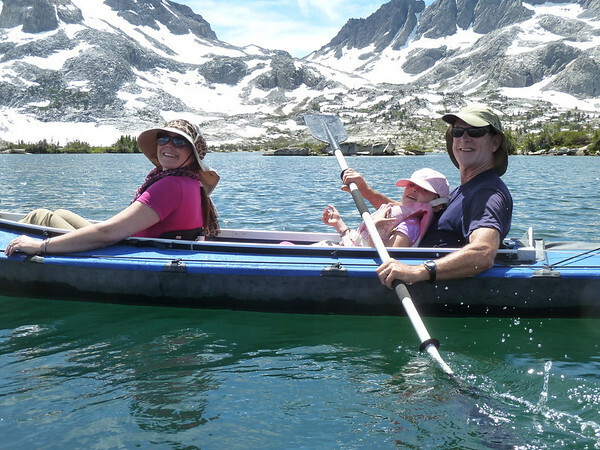 Your family looks so happy on the lake and in the kayak with you. Good Times, that's for sure. Generated in 0.022 seconds in which 0.015 seconds were spent on a total of 14 queries. Zlib compression disabled.